The following story of mine was published on ATMA's magazine The Gazette April/May/June 2006 with following photos. The best part of Finland in my mind is Lapland. Especially in winter time when there is lots of snow, fresh air and such a beautiful environment with all those reindeers. The only minus is that it is a long way to drive there, almost 1000 km and that’s a lot inside Finland which is only 1300 km long country. We made a caravan trip there in March with my two young TMs. Lamppu doesn’t love travelling but he can tolerate it. Iiris was just 9 weeks old and she had just come to me from Estonia week before our trip to Lapland. She is such a traveller from the beginning. She just loves being in a car and sleeping there. The trip up to north went well. Dogs were comfortable enough sleeping in a caravan and having walks every time in a new place during stops. Iiris was also able to eat when we were driving and she was also playing on the car. No problem at all. 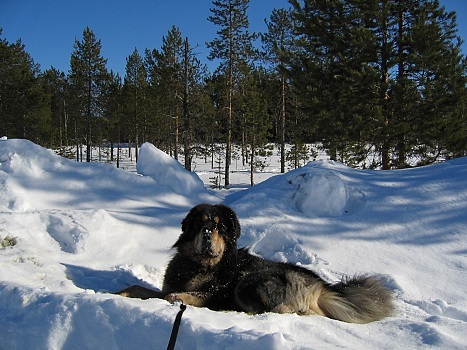 After getting to Lapland it took two days with Lamppu before his stomach was back to normal. He is such a dog stressing a lot about all new things. 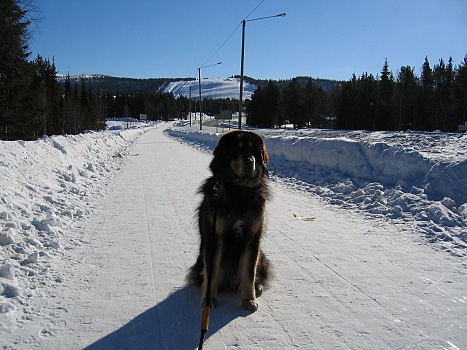 Weather was really fine all week long, not too cold for a puppy to be mostly outside daytime and we were able to do long walks in snowy Lapland. 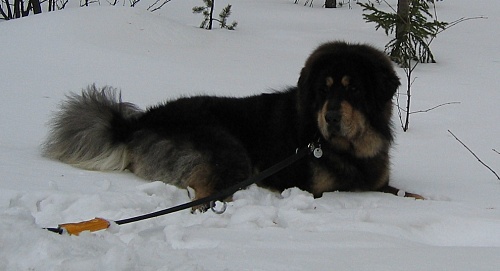 Best part of walks for Lamppu were all those snow baths he was having many times per walk per day. Another thing he was enjoying was the possibility to just sit somewhere up on a hill and just relax and watch all the things happening down there. The only minus was all those “monsters” with their skiing clothes and carrying skis and snow boards. Oh god they were very frightening for Lamppu. But little by little it was easier to understand that they are not going to eat or attack Lamppu. It’s so funny because people who don’t have a dog just can’t understand what is happening when TM is so suspicious of new things. I doubt everybody can easily understand how much attention Iiris got. 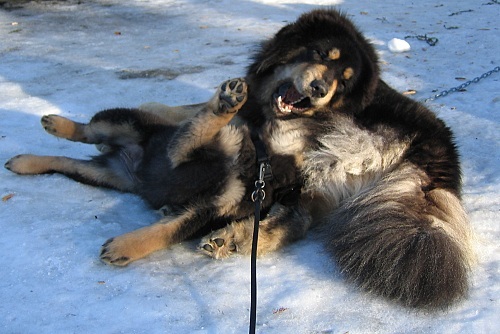 Everybody was smiling and came to say “Oh, what a teddy bear you have there” and asking the breed of course. TM is not so well known here in Finland. Iiris was such a natural with her leash although she hadn’t got used with it before. She didn’t have any problems walking on leash alone without Lamppu. It was a pleasure to notice how easily all was going. Lamppu was not even barking a lot on camping area although it was a new place and lots of people coming and going there all time. Well one week is a short time and it was time to drive home. Trip back to home went fine and Lamppu didn’t stress that much. It is so nice to notice that travelling a long way with dogs goes so nicely. Especially in winter time when it is cold and easy to travel. Finnish Lapland is such a paradise for me that if I could choose I would live there in a middle of nowhere with a big TM gang. 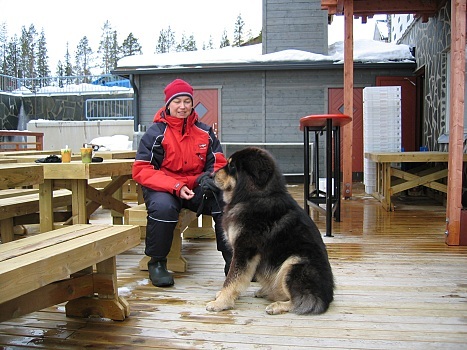 Then dogs could do their jobs guarding reindeers from bears and wolves as well. Maybe some day. There must be something to dream for.